It is about time we talked about my personal passion again, sharks! 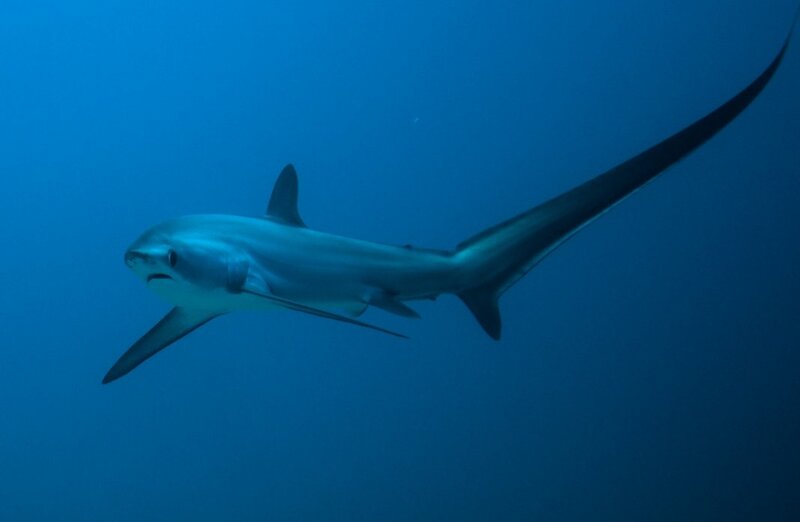 This time, we are going to talk about one of my favourite sharks, a species I studied for a long time, the Pelagic Thresher Shark! 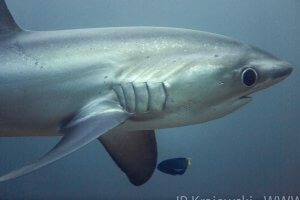 The Pelagic Thresher shark, also known as the Smalltooth Thresher, is the smallest of the 3 thresher shark species. Members of the Alopiidae family, they are all easily recognisable by their long tails. We will talk mostly about the Pelagic Thresher but will touch a little on the Common and Bigeye Threshers as well. 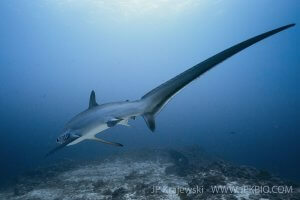 The Thresher shark gets most of its names from its tail. The name ‘thresher’ comes from the elongated upper lobe of the tail looking like a scythe and a thresher is a tool used in harvesting crops. Next comes the scientific name Alopias which comes from the Greek word ‘alopex’ meaning fox. Once again this name alludes to the long tail of the shark trailing behind it, like a fox’s tail does. The name pelagicus is from another Greek word ‘pelagios’ meaning ‘of the sea’. The scientific name of the Common Thresher, Alopias vulpinus, is even more on the nose about it as vulpinus comes from the Latin ‘vulpes’ meaning fox. The Pelagic Thresher is mostly found in the Indo-Pacific region but their true range is mostly unknown. We still know little about most of their habits, such as where they breed, where they hunt and what they do with most of their time. We believe they spend most of their lives in the open ocean, cruising between the surface and 150m. There have been sightings across the Indian and Pacific oceans, mostly appearing briefly at seamounts and deeper coral reef, however they are not seen at all in the Atlantic. While they can be seen occasionally in the Red Sea, they are most often seen in the Philippines off the coast of Malapascua island, on a seamount called Monad Shoal. We will discuss Monad Shoal in more detail later as the sharks are there almost exclusively to be cleaned, whereas they can be seen hunting further south in Moalboal. Pelagic Threshers are one of the most unique animals you will see on a dive! 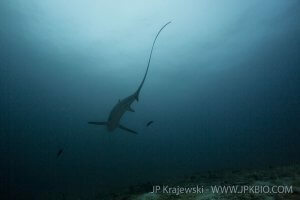 As they appear out of the blue, they are unmistakable with their large, broad fins and long tail. They remind me of a young animal that hasn’t grown into its large paws yet! The tail fin is the part of the animal you notice first. The top lobe of the caudal fin is massively extended, measuring almost half of the shark’s total length. This top lobe is not rigid and can be seen snaking back and forth as it swims along. The end of the tail has a very small notch that cannot be seen whilst diving and is one of the best ways to distinguish the Pelagic Thresher from the Common and the Bigeye, which both have large, obvious notches. We will talk a little more about the tail later on! The pectoral fins of the Pelagic Thresher are much larger than on sharks of a similar size, for reasons we will talk about later. In the water they give them a look of an aircraft cruising past and are another way to distinguish the Pelagic from the other thresher species. 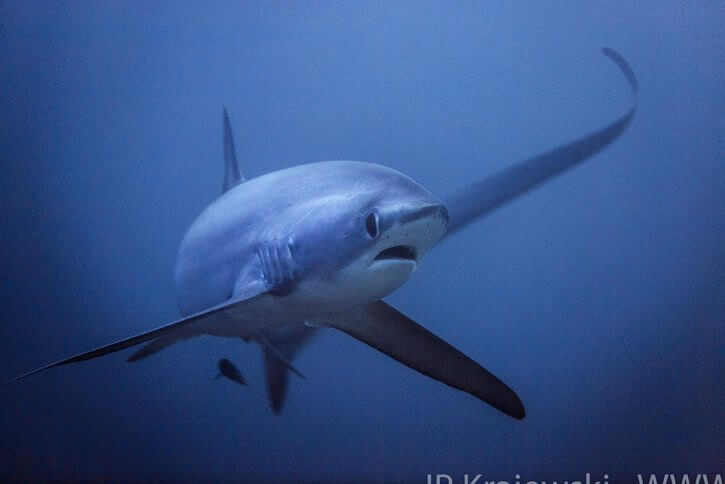 On the Pelagic Thresher they are broad, with a slight curve in them but terminate at a rounded point, whereas the other sharks all have defined pointed tips on their pectoral fins. The last few ways to tell them apart are the dorsal fin and the body colouration. 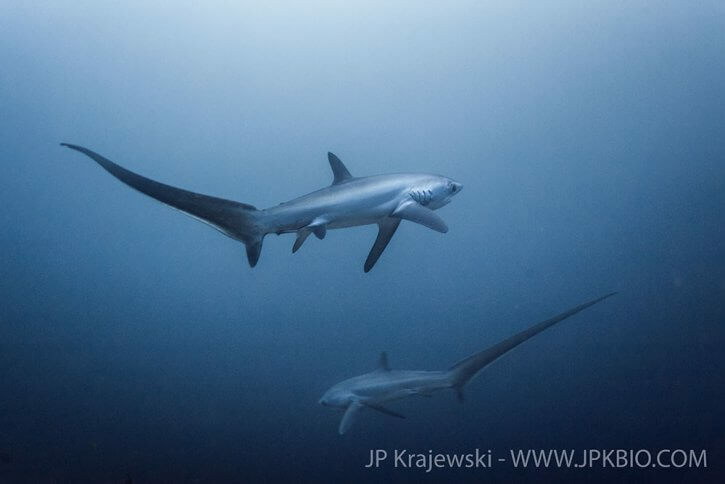 While difficult to see in the water, the Pelagic Thresher’s dorsal fin in almost perfectly between the pectoral and pelvic fins, whereas the Common Thresher is closer to the pectoral fins and the Bigeye Thresher is closer to the pelvic fins. Let’s talk about the body patterns. Like many other lamniform sharks, the Pelagic Thresher has a dark blue to dark grey top half and a pale white bottom half. This is called counter-shading, providing camouflage against the dark sea from above and the bright pale sky from below. The line separating these two shades in line with the pectoral fins on the Pelagic Thresher, whereas the lines are above them on the Common Thresher. Like its other lamniform relatives, the Pelagic Thresher has a tapered, fusiform body. This fusiform shape, which means it tapers at the front and the rear, makes it nice and streamlined, allowing it to cut through the water like a torpedo. Lastly, a quick note on the shark’s eyes. The eyes are huge compared to its body size, another nod to suggest it spends a lot of time in the darker depths. They also do not possess a nictating eyelid, the same as other lamniformes. Due to this, be careful when taking photographs. They can’t blink so the use of flashes can damage their sensitive eyes! When we looked at the Scalloped Hammerhead in an earlier edition, we touched on some of the ways sharks reproduce. Like the hammerhead, the Pelagic Thresher shows slight sexual dimorphism, where the male and female of the species look different. Males possess a pair of rolled fins attached to their pelvic fins called claspers, structures that work in the same way as a pair or permanently erect, prehensile penises. Other than these fins however, they appear very similar underwater. Similar to other sharks, breeding is a rather violent affair! The male has to be attached to the female so he can breed and the easiest way to do this is to bite down hard on one of her pectoral fins. This does not always happen on the first attempt, leaving females covered in bite marks and scars. However, females have thicker skin and reduced nerve endings to deal with this assault and they are not injured for long. Pelagic Thresher sharks develop using a process called ovoviviparity. This fantastic word means that they grow from eggs inside the uterus of the mother. Once they hatch out though, the battle has only just begun! The young sharks are uterine cannibals, where the strongest sharks eat the other young as well as any unhatched eggs. This is called oophagy, another of my favourite words! 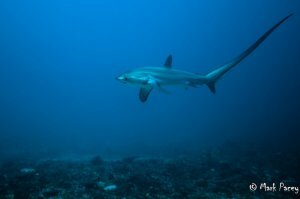 Pelagic Thresher females possess two uteri and young sharks will grow in both of them, leading to two sharks being born each time. In an interesting discovery, it has been shown that one uterus only makes male young and one only make female young, with one of each gender being born every time. It is unknown at this point whether or not each uterus only makes one gender but it would make sense. The young are born folded in half, as otherwise they would not fit inside the mother at full term. 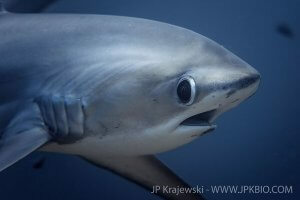 Female Pelagic Threshers mature at around 8 to 13 years old and males at around 7 to 10 years. As they breed every 6 years approximately and have a maximum age of 30 years, each female will only ever have around 6 offspring in her life, putting the species at great risk of overfishing. As I mentioned earlier, very little is known about the day to day lives of these elusive sharks. However, at the places where they can be regularly seen a great deal of study has been done to try and understand them. At the seamount known as Monad Shoal, off the coast of Malapascua island in the Philippines, the Pelagic Thresher can be seen on an almost daily basis. They are here for one reason and that is to get cleaned by the local cleaner fish. At dawn, just as the sun is rising, the sharks make their way to the cleaning stations to meet the fish as they wake up. Triggered by the sunrise, the cleaner fish wake up and are hungry, meaning that the cleaning service they provide will be the best. There are two main species of cleaner fish that inhabit Monad Shoal; the Bluestreak Cleaner Wrasse, Labroides dimidiatus, and the Moon Wrasse, Thalassoma lunare. There is also a species of combtooth blenny, the False Cleanerfish, Aspidontus taeniatus, which mimics the Bluestreak Cleaner wrasse but sneakily takes a bite of flesh rather than eating parasites. The Pelagic Threshers approach the cleaning station and swim over the top of it in a circular or figure-of-eight pattern to entice the cleaners over. The cleaners then eat and parasites or dead skin cells on the bodies of the sharks, paying extra attention to the gills and the cloaca where the parasite concentration is highest. After the fish have finished, the shark will swim off, allowing another creature to take its place and get cleaned. Around Monad Shoal, the sharks can often be seen breaching the water. This is believed to be to flush any parasites out of the gills that the fish might have missed. A little further down the cost in Moalboal it is an entirely different story. They are here to hunt the sardines that can be seen shoaling off the coast. It was thought for a long time that the tail was used to corral fish into a ball to be eaten but this is not the case. They hunt by whipping the tails over their heads like a scorpion. Swimming rapidly towards the fish, the sharks move their pectoral fins down quickly like a rudder or a brake allowing the tail to swing over like a bullwhip, killing the fish with the impact or stunning them with the shock of the crack. The shark can then eat the stunned and dead fish at its leisure. There isn’t much footage of this underwater so if you ever see it, make sure you can get it on film! 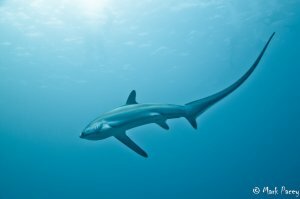 The Pelagic Thresher is the smallest of the 3 Thresher sharks, growing to an average size of 3m and weighing around 70kg although the largest known length was 3.8m. They have sometimes been measured at over 5m but this is due to the ease of confusion with Common Threshers and is not true. I have been incredibly lucky in my life as I worked with a research project specifically studying the Pelagic Thresher sharks on Monad Shoal. Spending 3 dives a day on the site taking video and still images of the sharks along with environmental readings, we were able to see the sharks on most of those dives and catch them breaching during surface intervals. In the water they are a very shy, skittish animal which stays a respectful distance from divers. Despite their size, their bodies are quite small so they can be intimidated by divers quickly approaching. The best way to interact with them is to calmly hover above the top of the coral a few metres away from the cleaning station and wait. The calmer you are, the closer the shark will come to you. You may see people waiting for the sharks who are either sat on or laying on top of the coral. This is hugely damaging to the coral reef! Make the effort to get your buoyancy right, stow any dangling equipment and take care not to damage the reef. The sharks are there to get cleaned on the reef, don’t destroy the cleaning station! One thing to also bear in mind is that the cleaning stations on Monad Shoal, and this is also true of the reef encounters in the Red Sea, are at around 22 to 25m deep. This will mean that you need to keep an eye on both your air consumption and your no decompression limits. Make sure you also have a long enough surface interval between dives to ensure you dive safely. The best way to see these sharks up close, however, is on a rebreather. One theory as to why the sharks are as skittish as they are is due to the amounts of bubbles released by divers waiting for them. A rebreather eliminates these bubbles so you can approach much closer. Ensure you continue to show the sharks respect and allow them to continue with their day, but if you are calm they will reward you with some stunning encounters. On some very rare occasions, you may find pairs of juvenile sharks coming in to clean. There isn’t enough research yet to know if they are siblings but other young sharks do team together to aid survival when they are small. Enjoy this special encounter, not many people see it! An encounter with a Pelagic Thresher is not one you’ll forget in a hurry. The best place to see them is on Malapascua island, but the dive starts early so be ready to get diving at 5am! We work with a resort called the Malapascua Exotic who do daily dives to see the sharks so if you are keen to see them, that’s the best way. They can also be seen in the Red Sea and we have plenty of great deals there at the moment, such as the Shark Quest with our in-house photo wizard, Mario Vitalini. It’s currently on for £1095 leaving on the 7th of December, spaces are limited so give us a call if you’re keen! The Pelagic Thresher is one of my favourite sharks to dive with and after hundreds of dives with them, they still blow me away. Waiting in anticipation for them to appear and then the shiver of excitement as they swim out of the blue is one of the best feelings I’ve had underwater. Don’t miss out on a chance to see these incredible sharks, speak to us now!